APSWREIS Inter 1st year Admissions 2019 for Girls | Admission into MEC and CEC Groups in APSWR Schools. 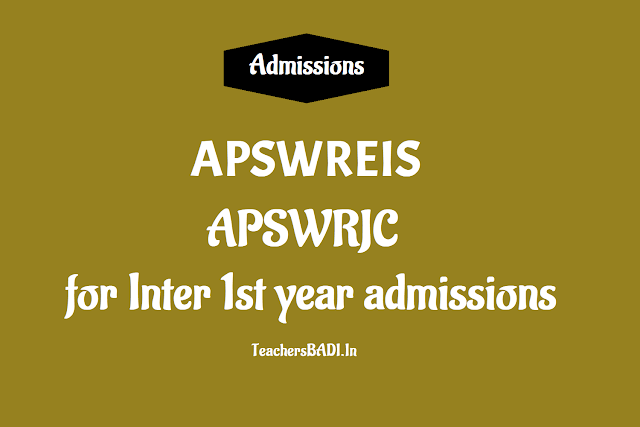 APSWREI Society Admission Notification 2019: The Andhra Pradesh Social Welfare Residential Educational Institutions (APSWREIS) issued Admission Notification 2019. This notification for admission into M.E.C. and C.E.C. Groups in APSWR Schools for the academic year 2019-2020. APSWREI Society invites applications from eligible Girls for admission into Junior Intermediate, English medium with M.E.C. and C.E.C. Groups in the following institutions functioning under the control of APSWREI Society. b) Students should apply within her own district. d) The annual income of the parent shall not exceed Rs.1,00,000/- per annum as certified by MRO. Age limit: The age of the students shall not exceed 17 years as on 31.08.2019 and in case of students studied in Social welfare residential schools and social welfare hostels relaxation of one year will be given. Selection Process: Selection process of the candidates will be based on Grade Point Average.